(don’t worry though! Mages, Warlock and Rogues have the same « limitation »). Some say that hunters (alongside a few other classes) are the kings of the battlegrounds. Simply put: you will « pwn » everybody. 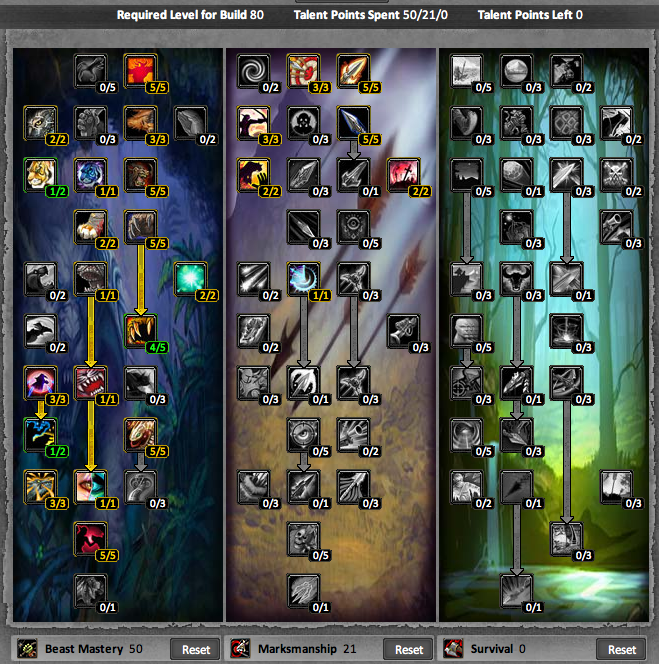 To level to 80, there is one talent tree that outshines the others. This is the Beast Mastery tree. This tree will focus on improving your pet, so that you can send it in and burn the mob down with ease. You will also do solid dps in instances. ==NOTE== At 80 I would recommend respeccing to a build that suits what you want to accomplish at end-game be it raiding/pvp/farming. You do not have your pet yet, so just use Serpent Sting and then melee the mob down. 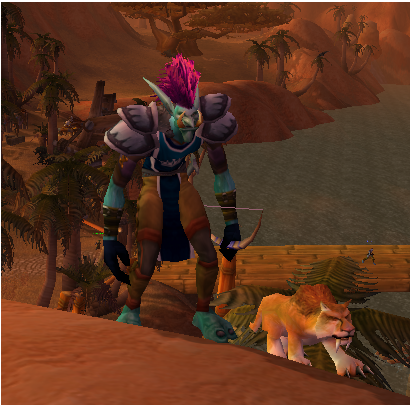 Send in your pet, make sure that Growl is on, and then Hunter’s Mark, Serpent Sting and Arcane Shot whenever the cooldown is up. Aspect of the Viper: From Level 20 onwards if you ever finding you are running low on mana, simply turn on Aspect of the Viper to quickly regain that mana. Now you have learned Volley you can use the « AoE Rotation » below when facing multiple enemies, or continue to use the above rotation for single target damage. ==NOTE== The AoE rotation stays the same from now on. Now, the rotation: Hunter’s Mark, Serpent Sting, and then spam the above Macro. What the macro does is that it automatically fires a Kill Shot if the enemy your attacking is below 20% health, and otherwise, it automatically starts a Steady Shot. For pets, you can use whatever you want untill Level 32. Then you get the Gorilla. Use Volley untill mobs die. For your pet, if you have a Gorilla his talent tree will be Tenacity. There are so many ways you can use this tree to benefit your playstyle, but I will link one . Just take this word of advice: Take everything that increases your pets Armour, Health and Happiness. – Titan Panel: This is a very useful addon for showing your Repair Percentage and Current Repair Bill and how much Ammo you have left. – OmniCC: The most popular spell cooldown addon. One of it’s many features is to add a cooldown countdown to all your spells. – MSBT: Replacement to the default scrolling battle text.